Malai Kofta is one of the most exotic recipes of Indian cuisine. 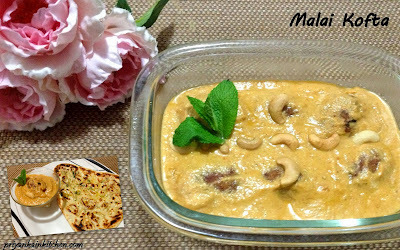 Malai means cream and kofta refers to a type of fritters that are made my combining potatoes with paneer, i.e. Indian cottage cheese. It is a mild and rich gravy that is best served with Naan or Lachha Parantha. Traditionally a good amount of cream is added to this gravy. But I have modified the basic recipe to a totally cream free recipe without compromising with its taste. 1 medium sized potato boiled and mashed. 1/2 tsp garam masala powder. Take all the ingredients except cashews and oil in a bowl and mix well to form a dough with hand. Take small lime sized ball of dough. Press with thumb in the center to form a cavity. Put some cashew pieces in center and cover it by pressing from sides using your palms. Give the shape of an egg and keep aside. Now heat oil in a pan. When hot add these balls and fry till golden brown as shown in picture. Take out and keep aside. Soak peanuts in 1/2 cup of milk for 30 mins. Now place roughly chopped onion with soaked peanuts in the grinder and grind to a smooth paste using the milk used for soaking. Don't worry even if some pieces of peanuts remain in it. Now heat oil in a pan. Add this mixture and fry until it starts to leave the edges of the pan. Now add tomato puree, cumin, chili, garam masala, black pepper and cardamom powder. Fry again until it starts to leave the edges of the pan. Now add milk and let it bring to boil. You may need to adjust the quantity of milk depending on the consistency of gravy. Add koftas just before serving and give a boil or microwave for 1-2 mins. Garnish with cashews and serve hot with naan or Lachha Parantha.